Many industries have been looking for a self-priming pump that meets requirements for improved energy efficiency and reduced noise levels, as well as the latest hygienic design standards. Using airscrew technology, the Alfa Laval LKH Prime sets a new standard in self-priming pump technology. This bodes well for the dairy industry, offering a sound way to realize low cost of ownership and increased up time. 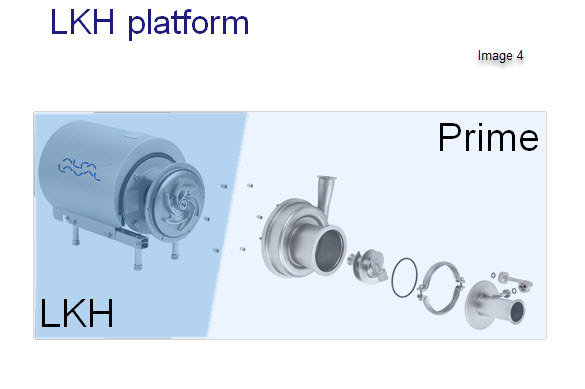 The hydraulic efficiency of the Alfa Laval LKH Prime reaches over 50% (Image 1). This means the Alfa Laval LKH Prime offers an added advantage over liquid-ring pumps, which typically reach efficiencies of approximately 30 percent. Its high efficiency is easily attainable at a wide flow range, which translates into substantial savings no matter the duty point. Energy efficiency is important for operations, and the Alfa Laval LKH Prime does not disappoint. It can be used as a Cleaning-in-Place (CIP) return pump for several different product lines so that the Alfa Laval LKH Prime is operational for several hours a day. Its hygienic design means the pump may also be used to empty dairy product tanks, which further increases the pump’s operating hours. The Alfa Laval LKH Prime also contributes to a better work environment. It reduces the noise emission level by up to 80 percent compared to conventional liquid-ring pumps (Image 2). Whilst reliable, liquid-ring pumps have always posed the challenge of excessive noise. In an attempt to reduce the noise, enclosures around the liquid-ring pumps and installed devices have been built or air has been added to the CIP liquid (less air in the product means more noise from a liquid-ring pump). This makes installations with liquid-ring pumps inefficient, expensive and still very noisy. With a noise level of a mere 74dBA, the Alfa Laval LKH Prime efficiently eliminates the need for these protective measures. LKH Prime Pump (Image 4). This advanced selfpriming pump is a hygienic workhorse hand-ling for CIP return duties where the liquid contains entrained air just as easily as other duties where require gentle product treatment is required. Why use two pumps when a single Alfa Laval LKH Prime is versatile enough to do both jobs and deliver measurable savings to your plant. As the Alfa Laval LKH Prime pump starts up, the centrifugal force generated from the rotation of the airscrew and the initial priming liquid causes the formation of a liquid ring in the pump head canister (1). This also fills the recirculation pipe (2), thereby achieving the initial prime. This liquid ring is formed in the space between the diameter of the inlet pipe, therefore also to the centrifugal stage and the outer diameter of the canister housing the airscrew. By design, the canister is offset from the center of the airscrew and the resultant liquid ring creates a water seal between the airscrew hub and the top of the canister (3). Due to the offset design, an air column is created between the airscrew hub and the liquid ring at the bottom of the canister (1). The rotating vanes of the airscrew separate the air column into air pockets, which are forced through the canister into the impeller’s suction stage. Some of the initial priming liquid re-circulates from the casing discharge into the airscrew casing through the recirculation pipe (2). Until all the air has been evacuated, air pockets will continue to be generated. When the air content is just a few percent, the air is contained as bubbles in the liquid. No air pockets are generated. Instead the liquid/air mix passes through the canister into the impeller’s suction stage (4). Here, the pump acts as a traditional centrifugal pump, transferring the liquid through the discharge (5) at a higher velocity and pressure (image 5). When there is no air present, the canister and recirculation loop have no function and are completely filled with liquid. The liquid passes through the canister into the impeller’s suction stage. Here again, the pump acts as a traditional centrifugal pump, transferring the liquid through the discharge at a higher velocity and pressure. With the further benefit of spare parts commonality with the Alfa Laval LKH pump range and operational flexibility the Alfa Laval LKH Prime Pump is the obvious choice for pumping liquids containing entrained air.